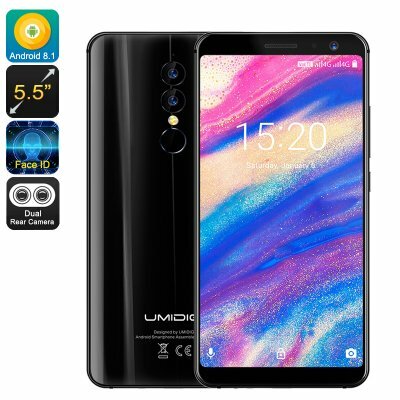 Successfully Added UMIDIGI A1 Pro 4G Smartphone-Android 8.1, 5.5 Inch, Face Unlock, 3150mAh, 3GB RAM, MTK6739 (Black) to your Shopping Cart. UMIDIGI A1 Pro have 5.5 inch display . Triple cameras, 13.0MP +5.0MP dual back cameras and 5.0MP front camera, you can enjoy images with high resolution. With 4G and supporting a wide spectrum of frequencies, you can enjoy breathtaking mobile data that allows you to stream HD movies while on the go. The A1 Pro also has 16GB of internal storage and the option to expand this with a micro SD card adding up to 256GB additions space. So if you have a library of entertainment you'll find the A1 Pro has plenty of room for all you're media and storage needs. This UMIDIGI A1 Pro smartphone comes with 12 months warranty, brought to you by the leader in electronic devices as well as wholesale Android phones from China..